Bunk beds started out as a way to save space when living in close quarters. The double and sometimes triple stacked beds are a great way to fit more people into a smaller space. As bunk beds have progressed, we’ve seen people start to utilize them in a more fun and modern way. Rather than being built as a space saving necessity, they’re now being customized in all sorts of different ways. 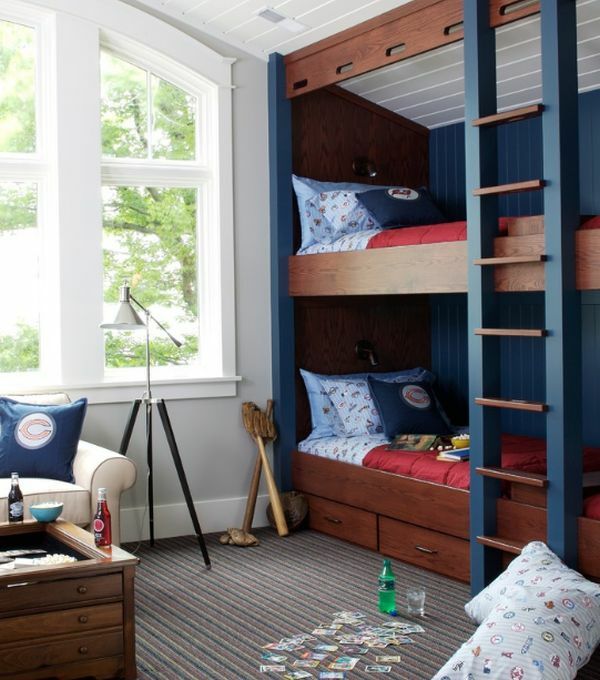 We’re going to give you some awesome bunk bed inspiration ideas that will change the way you think about bunk beds! 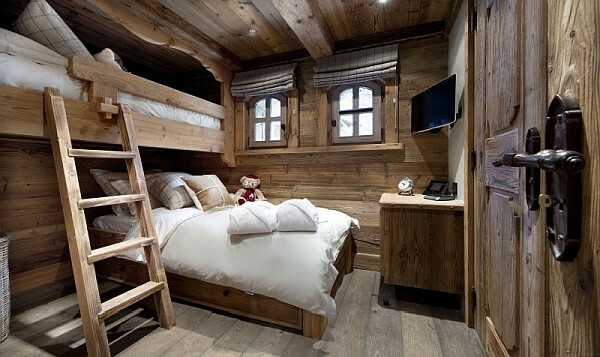 We’re going to start this blog post off with a bang with this awesome, ski cabin/mountain inspired bunk bed set up. The two bunk beds (four beds total) are off to the side in this living/media room. This is a perfect example of the way bunk beds have evolved over time. 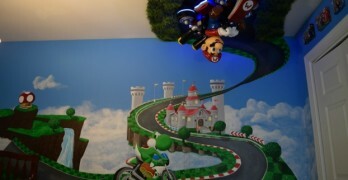 Their space saving ability allows them to easily be pushed against one wall and even built into the wall, like the ones in this photo. This gives you plenty of space to enjoy the room and not have to designate it as only a bedroom. This example is especially extravagant because of the stone and natural wood. Bunk beds aren’t just for kids! 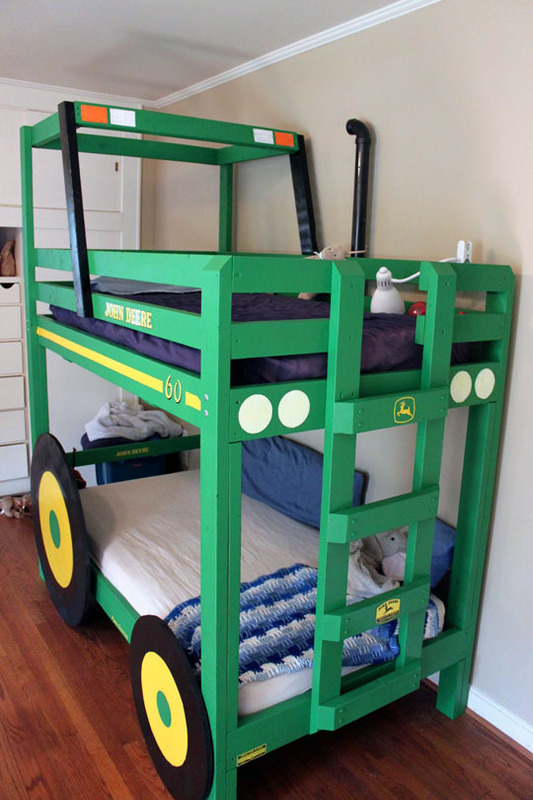 This is another great example of the cool customization you can do with bunk beds! This one features a cozy reading area with a couple stairs at the base. Rather than just a sleeping area, this is now a space that you can relax in, even when you’re not getting ready for bed. The boat/beach theme is apparent from the rope railing and boat cleat ladder to get up to the top bunk. Another classic bunk bed customization is different sized beds. The bottom bunk is extended a little so that it has room for a full sized bed while the top bunk stays a twin. Although we said that bunk beds aren’t just for kids, kids absolutely love them. This is a great custom bunk bed for young children that is budget friendly. There’s plenty of space and now they’re (kind of) sleeping on a John Deere tractor, who would’ve thought! There are hundreds of examples of bunk beds being turned into cars, castles, little houses, etc. The list goes on. Just because you have a bunk bed set up doesn’t mean it can’t be a little modern! These symmetrical beds are set up so that you’re not quite sleeping right on top of each other. This is a design that’s usually utilized for a more “adult” sleeping arrangement. One of the best things about this set up is that it can be customized in a bunch of different ways. If you were to take out the bottom bed, it’s not really a bunk bed anymore. BUT, that space can be used as a desk/study area or a cozy reading nook. The possibilities are endless. We love this example because of the all the storage space that’s available. Like we pointed out in a previous picture, the bottom bunks are bigger than the top so if needed, you could sleep 6 people in this space. The ladder is replaced by stairs to the top bunks that also have storage drawers. This bunk really maximizes the space that it takes up. The rustic cabin feel is a classic design choice when putting together a bunk room. You’ll find this kind of thing a lot in winter cabins at ski resorts. 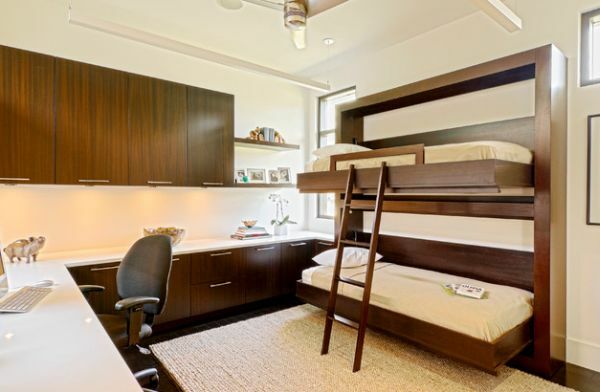 As is the norm for bunk beds, it’s all about maximizing space. That doesn’t necessarily mean you have to sacrifice comfort. If you’re the lucky person who gets the bottom bunk, you’ve got plenty of room to stretch out and enjoy yourself. 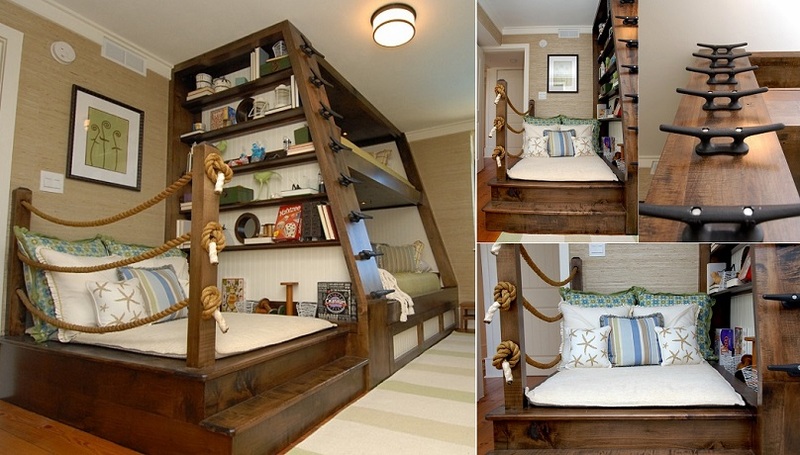 Bunk beds are usually built in a standard way, but we love how this one was designed. The enclosed bunks give you a feeling of privacy that isn’t super common when it comes to sharing a bunk. 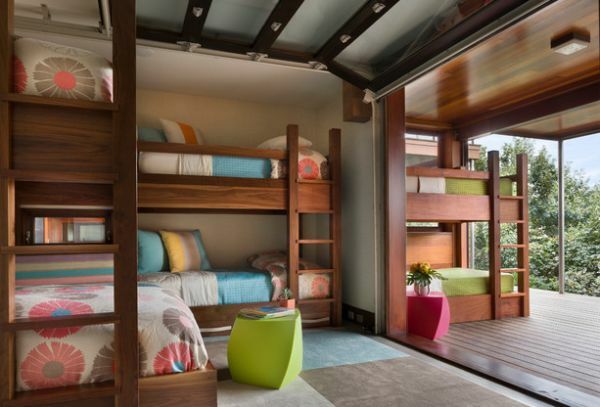 This unique design is great for kids sharing a room that might want more privacy than your standard bunk. The sleek modern design shown in this picture is a unique combination of office space and bunk room. If you’re really tight on space but still need a place for your guests to sleep, this is the way to do it. This is more of a standard bunk bed set up than some of the other bunks pictured. However, something basic like this is perfect for kids. There’s some storage available and this kind of set up is super easy to paint! Finally, this indoor/outdoor bunk bed set up! The L shape bunk beds is a cool design that we don’t get to see very often. Couple that with the garage door and outdoor bunk set up, this is a winner! 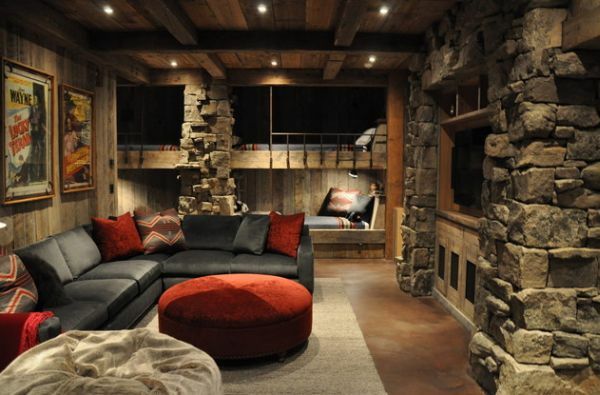 Who doesn’t love some indoor/outdoor sleeping areas? If bunk beds aren’t really your thing, no worries. 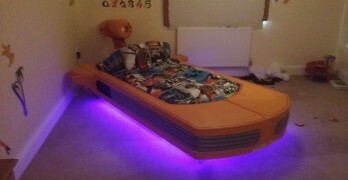 We’ve got a huge selection of awesome platform beds at PlatformBedsOnline.com!